Beachfront trance parties in Goa are somewhat legendary in the global party community. Revellers with a lot of stamina groove to psychedelic music under the stars, while famous Bollywood personalities put in cameo dancefloor appearances. 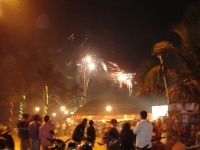 Although the entire coastline comes alive to party into the New Year, festivities inevitably centre on Anjuna. If you prefer a more intimate setting, then seek out one of the smaller beaches, like Palolem with its somewhat smaller gatherings. Travellers in Goa should note that the authorities have been cracking down on the party culture over the last few years, imposing increasingly strict liquor laws. As the state is undergoing something of a transition, tourists are advised to check up on the current situation before going.